I must admit, when I was asked to review a product called Tigressa from Carpet One Floor and Home I wondered, what could be so special about carpet? Having been in the carpet industry for over 20 years, carpet is pretty much carpet and this looked like many other gray carpets I had seen– with one difference—it didn’t feel like all the rest. It was extremely soft; in fact it felt like silk. I thought, this is nice but don’t all new carpets look and feel good? And if this is so soft, won’t it mat and crush easily? Basically, soft carpets over time have a tendency to lose their resiliency, (bounce). I wondered, can you really get luxury and performance in the same carpet? I decided to put it through the test and see how it would hold up under some rigorous abuse. I turned my three cats loose with some catnip and they started to dig away. (By the way, I wouldn’t suggest the “cat test” since carpets aren’t warranted against cat claws or cats in general.) But I figured, why not put it to the test? To spice it up, I added some ketchup, mustard and wine to see about the carpet’s stain resistance. Let’s start with the cats; they spent three days digging at the carpet and still not one tuft was missing. This is definitely abuse and a strong testimonial for any carpet since carpets aren’t “cat or dog proof.” The cat continue to play on the carpet and still no problem. I went back through the literature to check and see if the carpet had been “walk tested.” The “walk test” is an industry standard where carpet is subjected to 20,000 human steps and then compared to other similar carpets. 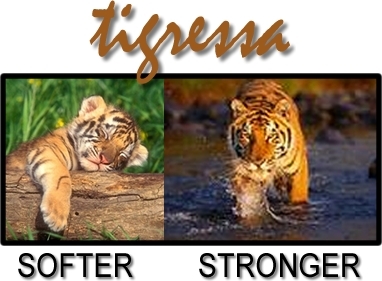 The test showed that Tigressa is less susceptible to crushing and matting than other similar carpets. Although the results of a walk test are not readily available it’s a good question to ask your salesperson when purchasing a new carpet. This is a good testament to Tigressa. Back to the staining; I noticed when pouring the staining agents on the carpet they immediately pooled up on the top of the fibers and weren’t absorbed. When I came back 10 minutes later, the liquids were in the same place. I decided that since I know there are two things that set stains; time and temperature, why not use my hair dryer to force the staining agents into the fiber? Even after 20 minutes it was obvious that the stain resistant was strong enough to not allow the agents to penetrate the fiber. I found that Tigressa has a very effective stain treatment which resists staining from the top through to the bottom of the carpet. Even a liquid that’s been on the carpet for some time may be easily removed. In addition Tigressa’s patented color provides fade resist technology so that carpets remain vibrant throughout their life. Back to the silk-like feel of the carpet; this is quite unusual. It is due to the fact the fibers are ½ the size of a human hair making them ultra soft under foot. In addition there are more of them in the fiber bundles (often called tufts); meaning more fibers per square inch. This accounts for the resiliency or “spring back” of the carpet and the luxurious feel. We are all concerned about the environment when purchasing products. Tigressa is made with nylon 6 fiber; a natural, sustainable source and can be recycled over and over and has earned the Green Select label. This designation is given to carpets that meet environmental, safety and health requirements—a green carpet for your home. If you’re looking for luxury and performance in a carpet, I suggest Tigressa. Lisbeth Calandrino is Associate Publisher of Fabulous Floors Magazine, F.C.I.T.S.Certified Floor Covering Inspector and has been teaching carpet product knowledge classes for the past 20 years. She can be reached at her website, Lisbethcalandrino.com.